Benefits of Using a Baby Hammock | Why Use a Baby Hammock? Is a complete alternative to a cot and can be moved anywhere you go with your baby. Clinically controlled studies confirm that by providing physical contact, enclosure and rhythmic movement, young babies, whether full term or premature, evidenced significant improved physical and psychological development. 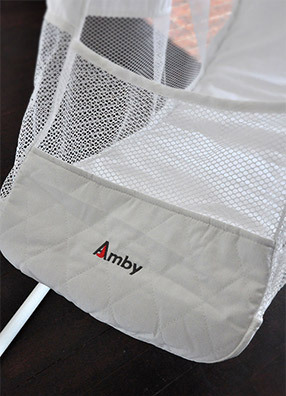 The Amby Air Baby Hammock was developed from this knowledge and understanding which pinpoints how babies best survive, grow and develop in the first 12 months of their life. The hammock is particularly good for enabling babies to sleep for longer periods and provides proven comfort for those with colic or reflux. 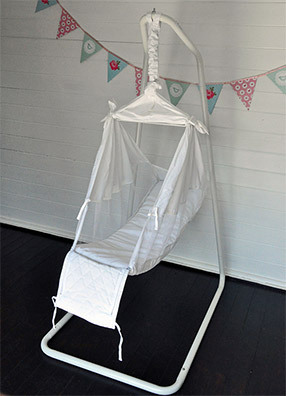 In the baby hammock, your baby can be placed on their back in a natural reclining position, which can often help to relieve colic and reflux symptoms much quicker than if they are lying flat on their backs. Many 'Amby Hammock' babies soon find that when they move, their hammock moves too, and, before you know it, they have gently rocked themselves back to sleep. Because they create this rocking motion themselves, it tends to keep them sleeping for longer – as witnessed by many of the thousands of people who have bought an Amby Hammock over the past 25 years. And as any new parent knows, having your baby sleep for longer is a real bonus, as if they sleep longer, then you can sleep longer too! Sleep deprivation for a new mum or dad can be tough, so anything that can improve this situation has to be of benefit. In an historical context cots are also relatively new whereas hammocks have been used for centuries in many parts of the world. There is an early reference to the use of hammocks as long ago as 400BC in ancient Greece and Spanish colonists wrote about them being used by Native Americans in the West Indies in the 16th century. In South East Asia the hammock has been the baby bed of choice for centuries. Cots and cribs really only began to be developed in the 1800's and were predominately a European (and subsequently American) phenomenon as they have remained to this day. Most people in the western world don't use a hammock but stick to a more traditional cot but our mission is to let people know that there is an alternative and one that brings benefits to the baby and to the parents! And our hammock is stylish and will fit nicely into any household. 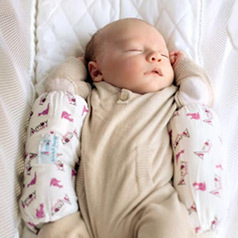 Help your baby feel comforted and secure by gently cradling him or her in a natural way, similar to the womb. This familiar feeling provides a sense of security for your baby and promotes a settled sleep. Provide a gentle swaying motion when your baby moves, helping to gently rock him or her back to sleep, meaning less time awake for parents in the middle of the night. Distribute your baby's weight more evenly, causing less stress on muscles and joints, helping to prevent a misshapen or flat head, which can be a problem in flatter and much firmer beds like bassinets and cots. Enable your baby to lie in a more natural position, on their back that can ease their discomfort if they suffer from colic or reflux. Be easy to assemble and dissemble - once you have set it up the first time. This means you can take it everywhere and, no matter where you are staying, your baby gets to sleep in their own familiar bed all the time. 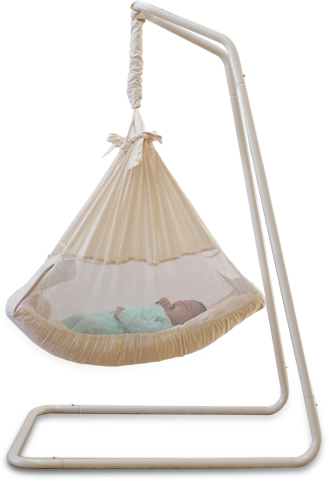 Let your baby use the hammock until they are about one year old although the real determinants are weight and height. 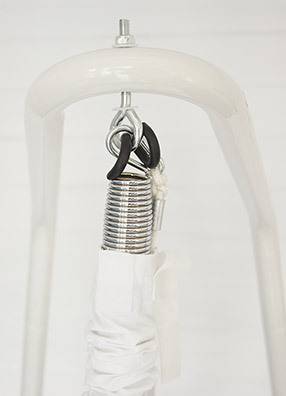 With one spring, the hammock can take babies up to 12kgs in weight but many parents add a second spring such that the maximum weight can go up to 24 kgs. With height, the hammock mattress is just over 1 metre long and babies approaching 1 metre should really be moved out of the hammock and into a bed or a cot. Even though hammocks have been around for centuries, some well-meaning (but often uninformed) friends may criticise your decision and question the safety and appropriateness of using a hammock. Welcome to parenthood! Feel secure that you have researched your decision and it is only your decision to make. Trust yourself and know that you have made the decision based on what is right for you and your family. And then let your baby enjoy him/herself in these critically important early months.